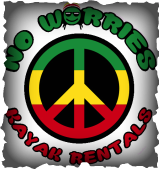 No Worries Kayak Rentals opens at 8:00am 7 days a week! You can make a reservation by calling us at (256) 927-7102 or clicking here. Our office is conveniently located directly off Highway 9 at the Ellisville Bridge. This easy-to-access location makes it possible for all of our customers to have No Worries! No Worries Kayak Rentals provides services necessary for experiencing one of Northeast Alabama's greatest natural treasures. No Worries on Terrapin Creek is perfect for every customer. While No Worries provides rentals and shuttle options paired with unforgettable customer service, Terrapin Creek provides an easy float ideal for floaters of all ages and experience levels. We love to hear feedback from our customers. ​Let us know how we're doing!